PSA: I will be discussing toe issues. If you have a problem turn back now. Alright, I am having some serious toenail issues. My right toenail is about to come off completely. The second toe on my right foot has already bit the dust. I cut it down as far as possible, filed, and painted a fake nail on my nail bed. It looks fine. This is my big toe on my right foot. It is almost all the way off. The nail is just barely attached on either side and at the very base on my nail. Luckily it doesn't hurt at all. I am cautiously optimistic that this will all turn out fine. I am not sure though. I have consulted several different sources to get an opinion on what to do with this nail. I have a long run coming up on Sunday and I am definitely concerned. The nail felt fine for my 6 miles last night. I could definitely tell it was loose though. I don't want it to either fall off while running and have to stop and remove or get caught and rip leaving my with a bloody mess. I am also slightly concerned with the nail on my left foot. I suspect it may also revolt after my run on Sunday. Right now it is covered up so I can't see the damage. If I can't see it, it doesn't exist right? I am free for the weekend! I have finished my mid-week runs without too much difficulty. Here is a quick recap and then I am off to finish errands before camping. Tuesday night I completed a 12X0.25 at 11 min/mile pace. I have decided that I really like running on the treadmills on Tuesdays because I can control my pace and watch HGTV. Do you know who is on Tuesday nights? Well only the cutest couple ever Chip and Jo from Fixer Upper. They really make the runs easier. I struggled a bit and walked a few of the intervals. I ended up keeping to a 12 min/mile pace though. I was still pretty sore from the 20 miler. I think the power walking did me in more than the running. I had no problem running but walking was a problem. Today I have the day off for the Easter holiday weekend. First I was going to go to the gym at work, shower, and finish errands. I forgot due to budget cuts they close during certain hours. No I don't remember what they are. Instead I decided to run at home. I got everything ready and started. Boy it was rough. I made it .75 miles and called it quits. I took an allergy pill and headed outside. Now it is still windy, and cold but I decided to do it anyways. I pounded out the run and ended up with a PR in mile and PR in 5k. I was pretty proud and pretty cold. The marathon just seems more and more a reality the more I train. I completed 20.6 miles!!! I am much more confident about completing 26.2 miles now. Now for a race recap. I arrived in Ardmore on Sat. evening in time for the pasta dinner. I picked up my packet with out my 3/4 zip. They were apparently stuck in Egypt and will be mailed. I headed over to the pasta dinner next door. The meal was pretty good and there was a presentation about the history of the race. I then headed out to check out Ardmore. I drove around a bit and decided to drive the race course. 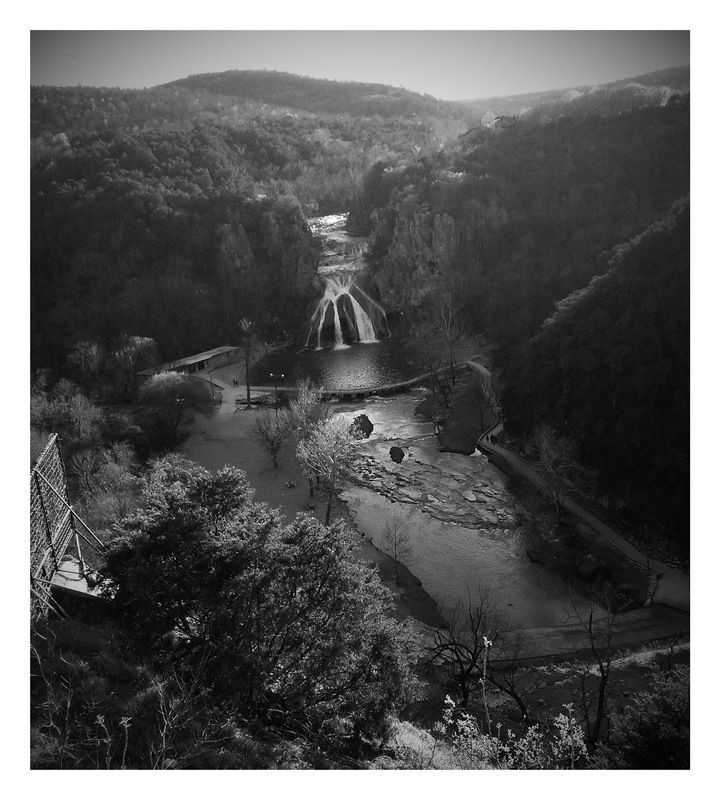 I headed north on OK 77 to Turner falls. I mistakenly headed down to the park entrance and had to drive through. I headed back up to the overlook and saw the site above. I am really looking forward to coming back here and exploring and camping. I am really glad the race started from the Overlook and not the park entrance. There is a definite elevation change uphill from the park entrance to the Overlook. After checking out the Overlook I head back to Ardmore and got some B&J vanilla bean ice cream to eat with my cookie I received from the pasta dinner. I also got an adult beverage. I may have accidently consumed the whole pint of ice cream. When I got back I sorted through my gear and prepared everything for the morning. I ate my dessert and watched Pitch Perfect 2 and HGTV. I headed to bed around 10 pm with a wake up of 5:30am. I didn't get the best night of sleep ever. My neighbors at the hotel were not very considerate. I put in my earplugs and did my best to ignore my nerves and the noise. In the morning everything went as planned. It was very chilly for the race start. I ended up wearing a long sleeve race tee with my bib holder over top. I had on compression toe socks and my good racing socks. I brought my jacket, gloves, and bandana as well. I was chilly at the start but more or less comfortable. At 7:30 am without much fan fair we were off to the races. The first part was in the Arbuckle mountains and there were a few hills. I started off at a pretty good clip but tried to keep my pace in check. I had bathroom issues about 3-4 miles in. Luckily there were plenty of bathrooms on the race course. I got back on the course and kept on going. The downhill part of the course was really cool for a geologist. I tried to read the signs to see what formation I was looking at while traveling down the hills. The next landmark was the Ranch around mile 6.5. I turned East and then South. I finally got to the turnaround point and started back North. Well the wind was coming from the North a little stronger than was expected. I would say 10-15mph. I made it almost the entire way back to the East-West road without stopping to walk. I just couldn't do it. I then headed up a nasty looking hill. I ignored it and kept on trucking. I at some point after this (past mile 11) had to go to the bathroom again!! I then figured out I may need a tampon....ugh. I had used one when I started and figured I would be fine since I would be finished in about 4 hours. Well I wasn't. I asked at every water stop after that if anyone had one. No one did. I got lucky though and someone found one and brought it to me on the course!! I heart race volunteers! I stopped around mile 16ish or so to use the facilities again. Around mile 17 the farthest I have run I just felt I couldn't keep running on my toes. My big foot was hurting probably from the downhill portion of the run. I tried running mid-foot but that didn't go so well. It is hard to change from fore to mid foot when I haven't trained that way. I tried power walking instead. I tried my hardest to keep up the pace. I was keeping a solid 12:30-13:00 min/mile while power walking. I ran once I got into the stadium and really pushed it the last .15 miles. I finished in 4 hours 16 minutes. I placed 2nd in my age group (out of 2 lol). I was very glad to be done. 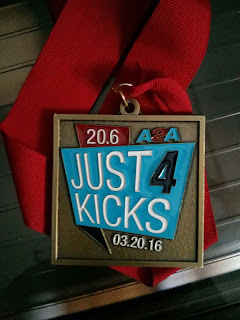 After the race I had to wait to get my medal. I ended up getting one from a local participant so they didn't have to mail it to me. I grabbed some food and warmed up under the heat blanket. Overall it was a pretty good race. I learned I need to be more aware of what I am eating before the race to avoid bathroom issues. I need to carry extra supplies if I think I will need them. Now I am sure I can complete 26.2 miles in 6.5 hours and can walk the last 6 miles if needed. Right now I plan on running as close to 11:30 min/mile. I would like to finish the race in 5 hours. But just finishing will be good. I found a local running club that will be running the marathon course for 20 miles and will be joining them on that run. I am so close to the finish line. I am not exactly over my bronchitis but I waited as long as I could to return to running. After a week of rest and coughing almost night and day I returned to running. First let's do a quick recap. Over a week ago now I came down with Bronchitis. I only made it 5 miles of 18 miles on the Sunday long run. On Monday I hit up the doctor for some x-rays and meds. I took off my mid-week runs and rested. I also developed a runny nose from the Mucinex and think I may have developed a sinus infection. Luckily the doctor gave me meds for infections. I still am slightly congested in my nasal passages but I am ignoring it. This past Sunday I decided to go ahead and run/walk the 15 miles called for in my training plan. I know taking a few days off doesn't hurt but I didn't want it to be more than a week since a long run. The 15 miles went as well as could be expected. I would say I ran about a third. This felt like a small victory to me. The first 5 miles were rough as my body was clearing my nasal passages out and I thought I was going to go through an entire box of tissues getting the gunk out. The torrent of gunk did eventually slow though not stop. I spent most of the time watching Buffy and ignoring my frustration. I would have much rather been outside. The room I was working out in was hot as well despite my efforts to keep it cool. I was able to stick with my run and finish! Yesterday was my first test back at running. I decided to hit up the treadmill again for my interval training. The intervals were 8x0.5 miles at 11:05-11:10 min/mile or 5.4 mph. I am proud to report I completed all intervals without too much trouble. I did walk my rest periods at 4 mph for 0.25 miles. I almost upped the mph during the rest intervals because walking was annoying me but I am trying not to push myself too hard. Tom. I am scheduled for 8 miles at tempo. I plan on running on the treadmill again and since doing this will take 1.6 hours or about an hour and a half. They generally do not like having someone on the treadmill for that amount of time at the gym. I am optimistic about the run but do feel I might have to take a couple of walking breaks. This weekend will be the real challenge. I am going to the A2A Mercy 20 mile run. I have booked the hotel and am mentally trying to prepare. The race is all downhill which may be a blessing and a curse. I have already lost one toe nail and have a feeling a few more may be on the outs. Ah well. I am slightly worried about my knees since they will be my brakes. If the 20 miles goes well I may be back on for my marathon run. Well I am ill and I am not happy about it. This weekend I was supposed to run 18 miles. Well Saturday I wasn't feeling too great. I was slightly short of breath and had a cough. I should have run then because the weather was beautiful, sunny, warm and low wind. I had an appointment in the morning so I didn't get out until after lunch. When I arrived at the lake I just wasn't in the mood. If felt like the whole world was out running. I was tired and felt like I needed a nap. I decided to get some sleep and see how I felt. I was pretty determined to get up and get running in the morning. On Sunday morning I woke pretty early, had a quick breakfast sandwich and was off. I got to the lake and started running. I chose to go against the wind. I was still coughing but thought I would loosen up with time. I did decent min/mile for the first few miles. The third mile really hit me hard so to speak. I was running part of the mile against the wind, felt like I had to use the facility although I had just tried, and was fatiguing fast. I was getting so warm I thought I had a fever. I decided to go home and try to walk/run the last 13 miles on the treadmill. I managed to get back to my car while keeping my pace as close to 13 min/mile as possible. I was so relieved I made it back to my car without passing out. I had taken my rescue inhaler with me to be safe but didn't need to use it. I believe there is something in bloom right now that I am severely allergic too. The wind has been from the south quit a bit lately and I think we are getting wind blown pollen for TX. I think the combination of running with deep breathing, allergies, and tiredness contributed to my illness. Luckily I had an appointment with my allergy doctor scheduled yesterday. I had taken some Mucinex maximum strength on Sunday night and used my inhaler several times to help have more productive coughs. I took cough syrup before bed, but I was still awake quite a bit. I spent Monday morning feeling like I wanted to go back to bed. At the appointment I was given and x-ray to check for pneumonia. I am luckily and appear to be in the clear there. The doctor sent the scan to radiology to be sure. I was given a Z-pak, Prednisone and told to continue the Mucinex, take a cough suppressant to sleep. The kicker is I was told not to run. I told her I am trying to train for a marathon but no such luck. I was told to let my lungs heal before I try getting back out there. All this to say I am in a quandary. I am probably out for a solid week of training if I am luck. The best I can hope for at this point is to get my long run in on Sunday on the treadmill. I don't plan on running outside anytime in the near future. My treadmill and I will be seeing a lot more of each other. I am not happy about this but it is one of the only ways I can ensure I won't get as many allergens in my lungs. I have a 20 miler in two weeks. I am not terribly concerned about running this race. I should have been ramping down so to speak for that race anyways. I have run 17 miles and I am sure with the proper motivation, such as a finish line. I will be able to finish the race. My next concern in the marathon. The training program I am on specifically states that missed workouts can't be made up and that if injured or ill you should train for another marathon. Ugh!!!! Do I just play it cool by running inside when I am ready, run my 20 mile race and then see how I feel? I am seriously considering switching to the half. One I know I can complete it and will have a 20 miler under my belt. Two I am much more comfortable at a half. Another part of me says if you can finish 20 you can finish 26. ahhhh.. Well at least I have until the Expo to decide. I will see how the 20 miler goes and see if I can continue my training. I will make the decision at the expo whether to switch races or not. Here is hoping I feel better in a week. My life has been such a whirlwind lately. I somehow find myself sitting here finishing up Wednesday. Where did the time go? My run on Sunday went. I am not going to say it went well, but it went. I decided to go to the river to run. I had been on the trail the week before and knew approximately that it was 6.5 miles from work to the switch over point. I started out on the West side and ran towards the boathouse. The wind was from the North/NW making this pretty easy. The weather was hot as well too. I had my new shoes on and they were feeling great. I also carried a water bottle with me again to hydrate. I have been switching hands every mile to keep the muscle strain from holding the water even. Everything was going pretty well until about the half way mark. I had to use the restroom. The pizza I had the night before was not agreeing with me. I stopped at the boathouse and used the facilities. The one thing I do not like about running along the river is the lack of bathrooms and water stops. I finished up the run and headed home. I may have stopped for a scoop of ice cream on the way home as I missed lunch. It was delightful. Monday was super busy with a lot going on at work. I tried to do my best with stretching and not stressing. Yesterday I had an interval run. This was rough too. I am not sure if I am not fueling properly with my food. Or I need more sleep but running is not easy right now. I just feel mentally tired more than physically. I was able to push through it last night though. I did 12X400m or 12X0.25miles at 11:05-11 min/mile or 5.3-5.4 miles per minute. I rested for a quarter of a mile after each interval. I made it though. I am going to focus on stretching more today and tom. Hope the rest of your week goes well. It is half over already! !